Working a room successfully depends on seeing the roadblocks, responding with the appropriate remedies, and identifying the potential benefits. But in the end, what gets us through the night is the dynamic duo of CHARM and CHUTZPAH. I can hear it now: “Charm and Chutzpah in the same breath? They’re a contradiction in terms . . . and behaviors.” Not true! And walking into a room of strangers is a real risk—our egos are on the line. I know there are several Xtreme athletes and adventurers who would rather be rappelling, kite surfing or skydiving than risk the possible rejection a room can proffer. That’s why a dose of chutzpah is perfectly paired with a dollop of charm. In “charm” school I was taught how to dress, walk, apply makeup, smile, behave, and be well-mannered. These things are important, but charm includes something more, an elusive quality that draws us to people and makes us believe they care about us. When we charm people, they become comfortable and at ease. Who Do You Find Charming? Why? What do they do that makes you think so? Once we identify charming behaviors, we can emulate them. Pick one. Practice it. Then pick another. Take the baby steps suggested by Dr. BJ Fogg. Even more helpful is to make a list of those lacking in charm and what they do that makes them so. Then, avoid those misbehaviors like the plague in any room. Charm is a combination of warmth, good nature, positive attitude, a good sense of humor, charisma, spirit, energy, and an interest in others. My friend Diane Parente, a founder of The Leadership Style Center, has it. She is a consultant and speaker who helps clients define their image, and she has a wonderful sense of humor and laughter. People want to be around her. Charm is the ability to convey a type of caring that comes from the heart and soul . . . and she has it. An advice columnist once defined “class” as the “ability to make people of all walks of life feel comfortable.” To me, that definition also applies to charm. Ignoring someone because the title on her name tag doesn’t impress us is a cardinal sin. During a question-and-answer session after one of my presentations, an executive asked how, if she could only “invest time with decision makers, could she easily identify them?” This is a question salespeople often ask after being trained by some sales trainers of the old school of selling mentioned in Daniel Pink’s book, To Sell Is Human. I looked at this busy executive, paused, and said, “I think there is a commandment against thinking like that. 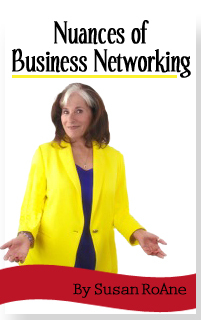 If not, there should be!” So I wrote it in The Secrets of Savvy Networking. How uncharming of her! And foolish. It ignores those who influence “decision makers” . . . and the fact that they could be the decision maker next year. You never know! When chutzpah and charm come together, it’s synergistic. The whole is greater than the sum of its parts. You don’t just have chutzpah and charm, you have MAGIC! You care about people, and you have the courage to walk up to them and let them know it. That’s a powerful combination, and one that enriches everyone concerned. But there has to be a balance between the two. The dynamic duo of chutzpah and charm isn’t a “to do” or a technique. It is something that we all have, and that we’ve developed to a greater or lesser extent. Now is the time to let it out and spread it around. There is no more effective way to work a room than to . . . be NICE in a room! People remember the people who make them feel special, comfortable, and conversant and whose demeanors make them smile. You’ll never have to bring, do or wear attention-getting gimmicks at any business or social event again! Nice is good . . . and memorable. Like Tom Hanks, that should be our goal. Some of the new rooms we are now working are virtual ones and have virtually expanded over the last decade. Being a savvy online mixer and mingler is vitally important. ★ Chutzpah and charm are the dynamic duo at the heart of working a room successfully. We all have the potential for these qualities. ★ Practice makes them stronger. They let us work a room with style and grace—and, ultimately, are what attract people to us. ★ Identify who is charming and why. What do they do and say? Don’t do and don’t say?